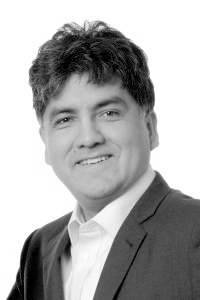 Anyone who missed Sherman Alexie’s lecture Thursday night in Hansen Theatre missed more than just a lecture. Alexie was a full-fledged comedy show. After an elaborate introduction by a senior student, Alexie walked on stage. Opening with a simple, “Hi” was all it took to make the full house laugh. After describing what he ate for dinner and acquainting himself with the front rows, Alexie told them they were going to be spit on. Then he delivered the first of many one liners of the evening: “It is an interesting day when an Indian is to come to Minnesota and spit on white people.” It was just the beginning. Even as the audience was laughing, there was a feeling of seriousness, too. Author of the well-known book, “The Absolutely True Diary of a Part Time Indian,” Alexie came to MSUM to talk about racism and its effects on Native Americans. Though laughter and racism do not seem like a ready combination, the author provided his reasoning for including humor. He said when he first began writing that he was angry. He then added, “Rage convinces nobody of anything…when you put funny in with the rage, people listen.” The lively audience did nothing but prove that theory. The structure of the lecture was set around the life of the speaker: starting with his birth in 1966 in Spokane, Wash., up until he moved off his home reservation. There were many tangents to his story, but each one ended with a relevant point. The audience soon learned the man on the stage should not be there. At 5 months old, Alexie was diagnosed with hydrocephalous; a condition where the head swells due to excess fluid on the brain. He was lucky enough to receive surgery, but even with it, the outlook was not good. The surgeon said he would either die during the process or live but be brain dead. There were parts of the talk that required no humor to make the audience listen. One particular comment from Alexie made the whole theater silent; a huge contrast to the boisterous laughter seconds before. Alexie shared, “Three of my aunts were sterilized after giving birth without their consent.” He also said many Indian children were taken away from their mothers and given up for adoption without consent as well, simply because of their race. Alexie went on to say, “Racism is based on surface stuff when there are real, passionate, personal reasons to hate people;” again, using humor to set off his point. A question and answer session followed the lecture. Students who were currently studying his novel were able to ask a question their class had created. Even during this session, Alexie had jokes to tell. His completely original lecture and the important messages it conveyed will not soon be forgotten by any in attendance.